It’s a side of Dounreay rarely seen by the outside world – otters, stoats and rare breeding birds living cheek by jowl with Britain’s biggest nuclear clean-up project. It’s a side of Dounreay rarely seen by the outside world – otters, stoats and rare breeding birds living cheek by A new short film takes viewers inside the redundant nuclear site to see how nature has adjusted to the decommissioning of Britain’s experiment with fast breeder reactors. The five-minute film Naturally Dounreay features bird-life and mammals such as otter and stoat that have taken up residence on the 135-acre site. It includes a 25,000 sq m area of ground that is now a wild flower meadow helping to reverse a decline in the rare great yellow bumble bee. 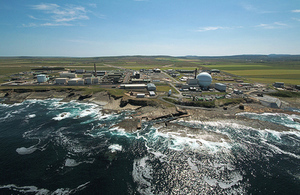 The film was produced for the site by freelance cameraman Chris Gregory to help raise awareness among workers of the importance of protecting the environment from harm during the site’s decommissioning. It can be viewed at You Tube. The film includes a soundtrack featuring Melvich Gaelic Choir and Atomic Piseag.